Just like you change your wardrobe, you should also change or update your skin care for winter. Some will need to make bigger changes than others, but it's very important for anyone to do some tweaking as winter means your skin will be aggravated from cold weather & strong winds outside, as well as artificial heat and very dry air inside. I have combination skin that is reasonably manageable during the winter, as long as I amp up my routine and stick to it. When I forget or when I'm slacking with the routine my skin turns very dry and uncomfortable - so I have been paying extra attention this year. And it's been working very well! Don't be afraid of a few extra steps in your routine. Your skin will love you for it. 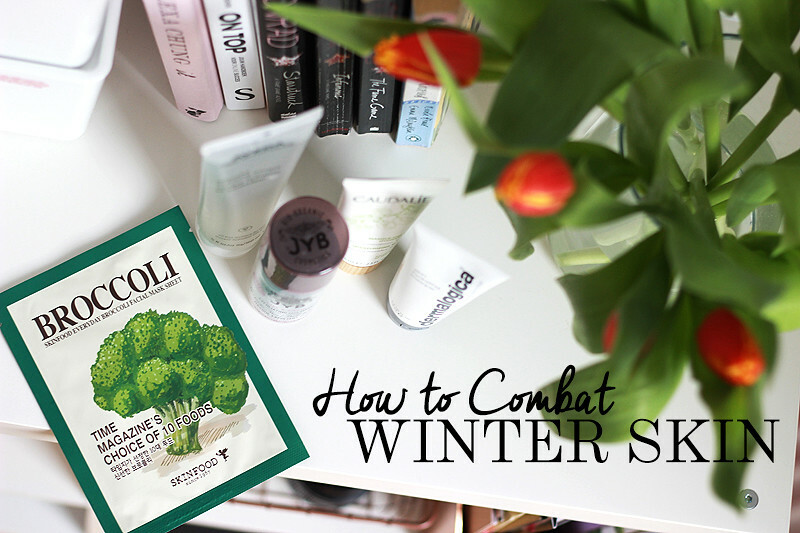 It's a good idea to think about essences & moisturising toners during the winter. Essences aren't a new thing, but are relatively new to Western skin care. Women in Korea have been using essences since forever & swear by this extra step that will both prep (exfoliate) and hydrate your skin to prepare it for serums & moisturisers. Two essences I've tried are Kiehl's Iris Extract Activating Treatment Essence (review here) and the new The Body Shop Drops Of Youth Youth Essence-Lotion. Reading the ingredient list I am most impressed by Kiehl's' essence as it contains a much higher dose of glycerin, although I do have to note that weirdly enough both essences contain alcohol (probably to make the product dry down faster). Toners are much more well known in our skin care routines - but do take a look at your toner to see whether it's really fit for these super cold and drying winter days. To tackle my dryer skin this season I have been liking Dermalogica's Multi-Active Toner (which smells amazeballs too!) and newly discovered Beauté Pacifique Enriched Toner for Dry Skin. 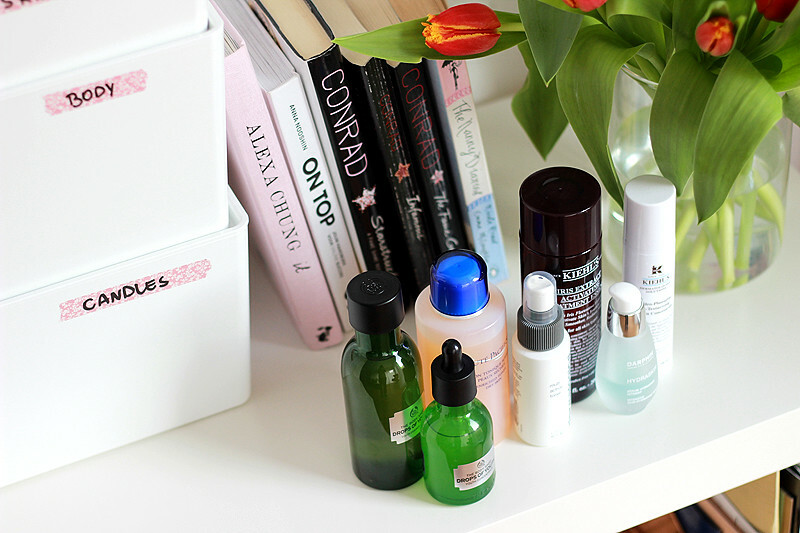 These will leave your skin slightly tacky and totes ready for your next skin care steps. And if you feel like going all the way - or if you feel like ditching the whole essence hype - you can also add a hydrating serum to your routine. I have really been digging Darphin's Hydraskin Intensive Skin-Hydrating Serum: it's very light-weight, immediately quenches my skin's thirst and feels very comfortable. Kiehl's also offers a great hydrating serum: the Hydro-Plumping Re-Texturizing Serum Concentrate. This one has a thicker consistency (and contains some silicone) that'll plump your skin instantly - it's a great one to use under the eyes as well. You can find a review here. Especially when it gets dark out really early it can be both very relaxing and very beneficial for your skin to hold a good old pamper sesh. I like to go all out with hydrating skin masks to lock in moisture and to restore some of that summer glow, while summer is still nowhere to be seen. The good ol' creamy mask you brush on yourself is perfect to use if you still want to be somewhat mobile, but if you're up for fifteen minutes of laying down (or in my case: watching YouTube videos) I find that sheet masks are the way to go. These give amazing results! My favourite creamy hydrating skin mask to wear throughout the night has been Caudalie's Moisturizing Mask (review here), it does the job perfectly and doesn't break the bank even though it has an exciting formula. Dermalogica's Skin Hydrating Masque (review here) came into my life recently though and oh my.. It's pretty awesome! It could easily share the throne with Caudalie - the only downside being that it's a whole different price range. Aveda's Intensive Hydrating Mask is also a great option that quenches my skin's thirst immediately, but as it's a little sticky this one is best suited to rinse off. 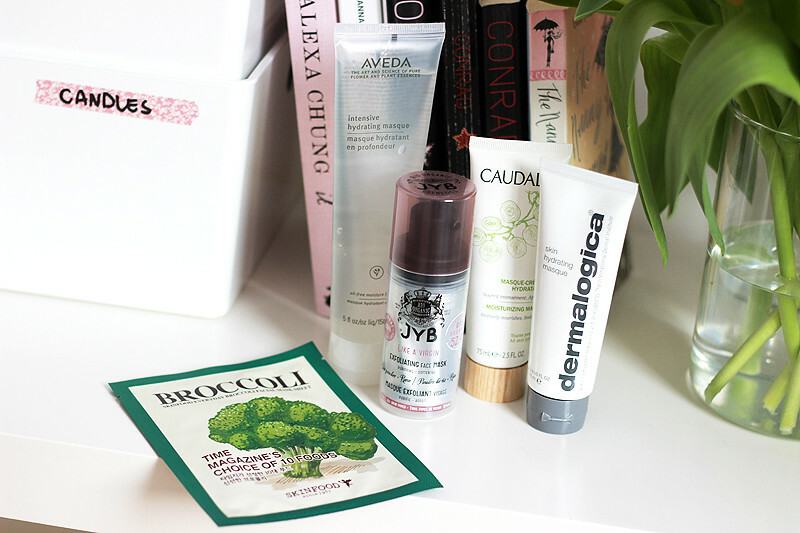 In terms of sheet masks I'm crazy about Skinfood's Broccoli Sheet Mask (read more about those here), it gives my skin a gorgeous glow. I've recently also tried a few new gel sheet masks - I need to do a separate post on those asap! For dry and sensitive skin types that find their regular scrub too harsh during the winter, I can recommend the very gentle alternative by JYB: Like A Virgin Exfoliating Face Mask. JYB is a Belgian natural skin care brand that works with organic ingredients as much as possible - this mask with Bulgarian rose and rice powder is 52.4% certified organic. 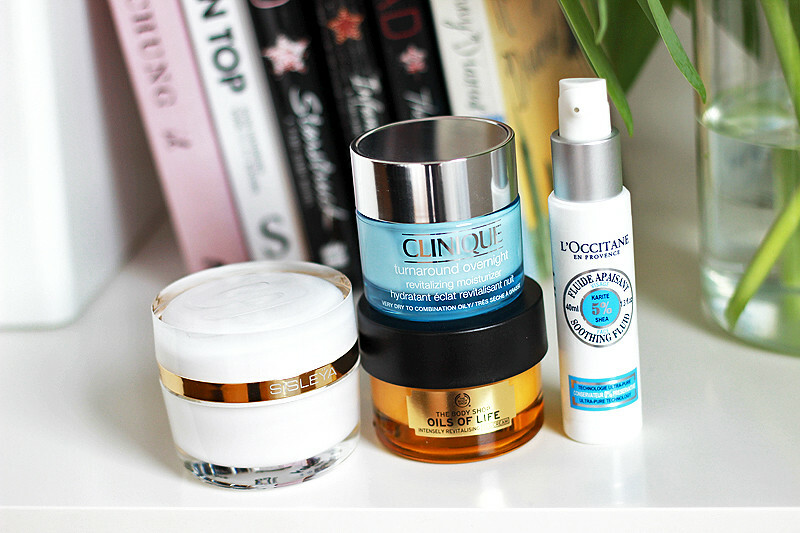 Don't forget to upgrade your moisturiser a little: you can go a little heavier & creamier for this season. A richer moisturiser will protect your skin even more from going as dry as the sahara as it'll also provide a barrier against those cold winds and dry indoor air. I've been experimenting with the renewed Sisley Sisleÿa L'Intégral Anti-Age moisturiser: a very high-end and luxurious anti-ageing care that had me wonder whether my twenty-something skin (I'm turning thirty next year) was already ready for the heavier stuff. This definitely wouldn't be right for my skin during summer time, but I've really loved using this one as a night time treatment this winter. Clinique's Turnaround Overnight Revitalizing Moisturizer is a lighter and more budget-friendly option for anyone who doesn't feel like turning to the hefty anti-ageing products yet but still wants a nighttime treat for their skin. During the daytime I've been switching between two newbies that both really tickle my fancy: The Body Shop Oils Of Life Intensely Revitalizing Gel Cream is a gorgeous lightweight but still very nourishing gel cream formulated with a precious blend of oils. This one is just perfect for oily or combination skin types - I really love it. L'Occitane's Shea Face Soothing Fluid is a little heavier but luckily still doesn't break my combination skin out. It feels wonderful on the skin and is my go-to moisturiser this winter when I know I'll be outside a lot or when I'm not wearing any makeup. I have combination skin & used to be afraid of using oils. "Why would you use oils on oily parts of your skin?". Using oils won't make your skin even oilier but instead it'll balance your skin so it feels more comfortable and doesn't go all overboard oily. And don't hesitate to give yourself a facial massage while applying.. Good routines to follow are the one by Lisa Eldridge or this guide by Caroline Hirons. 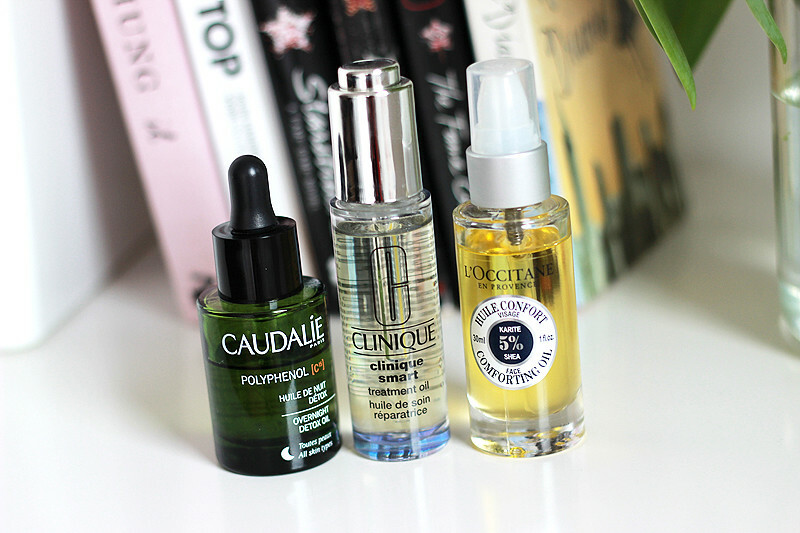 I have been trialling quite a few oils, but narrowed my favourites down to these three. Caudalie's Polyphenol Overnight Detox Oil (review here) is a beautiful overnight treatment oil that is formulated with an infusion of anti-oxidant grape seed, regenerating rose hip, purifying neroli, soothing lavender and detoxifying carrot oils. It makes my skin glow beautifully in the morning. I have been recommending this one to anyone looking for a nighttime oil that won't break the bank. Clinique's Smart Treatment Oil is relatively new to my beauty cabinet but has definitely succeeded to convince me already has a pretty big online following. And with good reason! This oil is great for anyone with sensitive skin as it contains a blend of plant oils (safflower seed, sesame seed & sunflower seed), antioxidants (clary extract, barley extract, wheat germ extract & vegetable squalene) and vitamins C and E, without fragrance. L'Occitane also released a Shea Face Comforting Oil, which is as the name says enriched with 5% shea butter and marula oil. This one absorbs quickly and makes my skin feel super quenched and soothed in the morning. It's so hard to pick one true favourite! To avoid confusion.. all these different products: in which order should they be used? After cleansing, you'll use your toner(s). If you use two, use the exfoliating toner before the moisturising toner. This will balance out your skin after cleansing and will serve as a first prep for your skin care. After this you can use an essence - just pat it in and wait until it's absorbed. 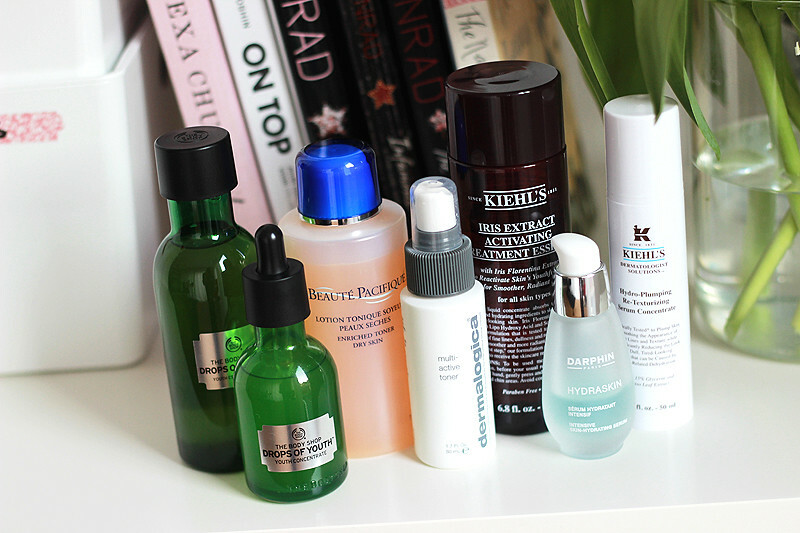 Now it's time for your serum of choice, followed by your moisturiser (and eye cream). And finally it's time to add SPF. Of course it's not imperative to follow each step - you could for example choose between an essence or a serum if you feel like your skin doesn't need both steps. Take your time to get to know your skin and what it likes best - it'll love you for it (and look the part)!